Association for India’s Development is a volunteer movement promoting sustainable, equitable and just development. 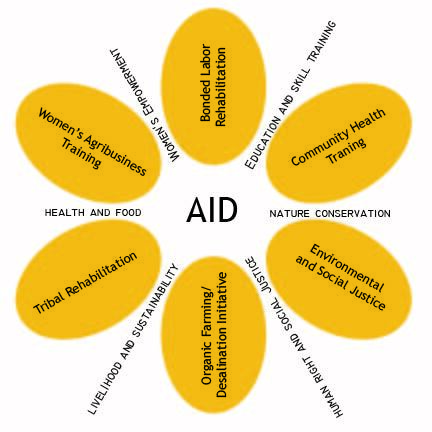 AID supports grassroots organizations in India and initiates efforts in various interconnected spheres. Association for India’s Development was founded in 1991 by students from University of Maryland who wanted to make a direct and lasting impact on the interconnected challenges of poverty, by supporting development projects and improvement of health and educational standards in Indian villages and urban areas. Starting with $600 and the vision of a solution-based approach, the organization has grown to include more than 30 chapters with over 1000 volunteers and supports more than 100 sustainable projects in India every year. Inspired by the history of AID and Jeevansaathis Aravinda Pillalamarri, Ravi Kuchimanchi, Balaji Sampath (now belonging to an independent NGO) , Rachna Dinghra and Kiran Vissa who bid adieu to their career in US and are now in “Swadesh” working on India’s development bringing justice, quality and equality in the spheres of rural development, education, health, housing and agriculture, several other individuals have given up their career in US, India and other countries to work for the cause of India’s development. Small volunteer groups have also mushroomed in UK and other countries. The acclaimed Bollywood film “Swades”, written and directed by Ashutosh Gowarikar of “Lagaan” fame, was partly inspired by the work of volunteers, who started the Association for India’s Development (AID). While scripting Swades, Ashutosh Gowarikar and his team visited Bilgaon, an adivasi village in the Narmada valley where AID supported an electricity generation project to light up the entire village. Ashutosh Gowarikar visited Bilgaon after spending considerable time with AID Jeevansaathis – Aravinda Pillalamarri and Ravi Kuchimanchi – who returned to India from the USA to work for development of villages and who were closely involved with the Bilgaon project on behalf of AID. The people of Bilgaon did 2000 person-days of shramdaan (donation of labor) to make their village energy self-sufficient under the inspiration of Narmada Bachao Andolan (NBA). More information of the Bilgaon Micro-Hydro Project is at http://www.aidindia.org/projects/illus/pedal.htm. Swades was released around the world on December 17, 2004 with a NASA engineer, played by Shah Rukh Khan, searching for his roots and enlightened by the very lights he brings to the village. Ravi and Aravinda were acknowledged in the film credits of Swades. Indeed, the movie reflects the journey that many AID volunteers may make in the future. For an interview on the film and on AID with Ravi, see http://www.youtube.com/watch?v=XsvoV1ZUrP4. To get involved with development projects in rural India please visit the AID website aidindia.org and its year-ending campaign “One for India” at oneforindia.org. 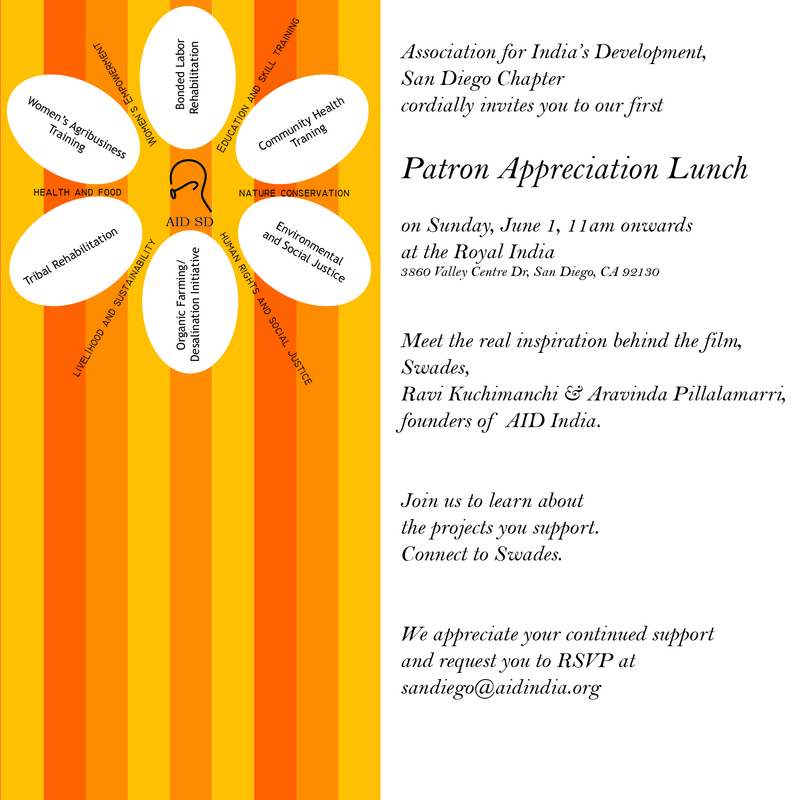 To get involved with AID San Diego chapter, please reach us at sandiego@aidindia.org.